This light blue pillar candle stands 7 inches tall and is 1 and 1/2 inches in diameter. It has been energetically charged by an experienced practitioner to increase the occurrence of dreams, enhance the dreaming state, and increase the frequency that dreams are remembered once awake. This ritual candle may help to remove the veil between the awake and sleep state or at least crack the door allowing one to explore and experience more. 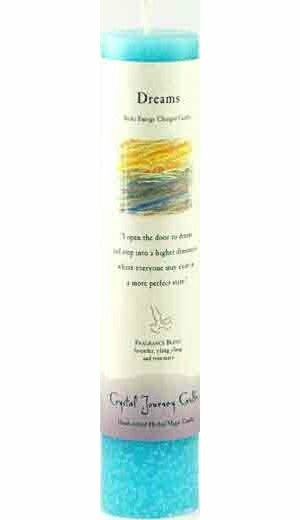 The Dreams Reiki candle is a potent tool for influencing all types of dreaming; it may help with the interpretation of dreams as well as aid in the process of a dream coming to fruition. It is suggested that the practitioner who utilizes this candle also inscribe some symbols, that correspond with the intention of the casting, into the candle prior to lighting it. The name of the person or persons the casting is to benefit would be one example of a symbol to carve into the side or base of the candle. This candle may also be anointed further with oils pertaining to the desired end result, however it is not required. This item was handcrafted in the USA.